Cypraea (Erosaria) beckii Gaskoin 1836, living inside base of black corals at 50-60m, off Masbate Island, Central Philippines, January 2014. 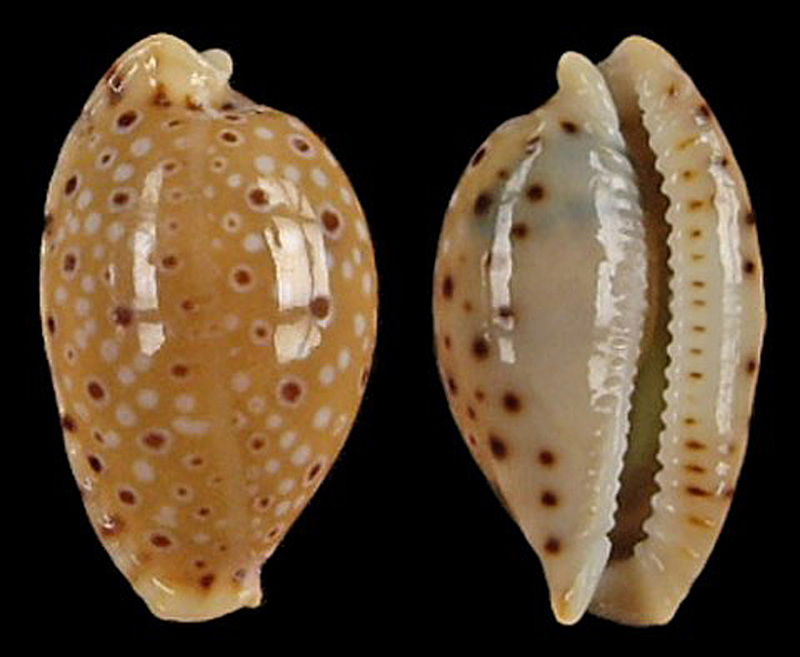 Cypraea beckii is a beautiful minute cowry growing only to 10-14mm in size. It is moderately rare and lives in deep water at the base of black coral. Until recently it was very difficult to obtain, alive or dead, however modern collection methods have made specimens more readily available. Although its range is widespread across the Pacific, virtually all specimens come from the Philippines. Cyrpaea beckii is fawn in color with a whitish base, its dorsum spotted randomly with white dots, about one third which are ocellated in black. The extremities are rostrate and the teeth are stained deep brown. Cyprare Beckii is named after Dr. H Beck, a Danish naturalist, 1799-1863. The winner of the shell of the month raffle will receive not one but two specimens, both of gem quality, with retail value of $15-$20 each. Please note that due to the small size, this is a representative photo and not of the specimens in the raffle. Donated from the collection of Richard Kent.